The SQL Server Audit feature was introduced the first time in SQL Server 2008, available only in the enterprise edition, as a complete, secure and easy to manage auditing solution to track the changes performed at both the SQL Server instance and database levels, with the minimal performance impact on the audited server. SQL Server Audit is built using the SQL Server Extended Events feature, that makes it lighter and easier to audit different types of operations and changes performed at the different SQL Server levels. Rather than spending the time configuring the Extended Event session to create a SQL Server Audit solution, you can use the SQL Server Audit feature directly with the minimal required configuration effort and the audit records will be written automatically to the Windows application log, Windows security log or a separate flat file. The parent component of the SQL Server Audit feature, that contains both the Server Audit Specifications and the Database Audit Specifications, is the SQL Server Audit. SQL Server Audit is used to define where the audit information will be stored in the audit, if it will be performed in synchronous or asynchronous mode, how to handle the audit file rollover, and what action will be performed in case of audit failure. All this information will reside in the master system database. Take into consideration that the Security Logs are more secured and access restricted than the Application Logs. In addition, the Application Log events will be overwritten automatically when it reaches its maximum size, that may result in audit data loss. 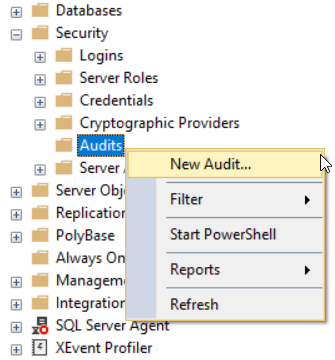 The name of the SQL Server Audit file will be generated automatically, in order to make sure that each audit log file will be assigned a unique name. The unique name of the audit log file will be made up of the Audit name, the Audit GUID, the Partition number and the Time Stamp. Take into consideration that you cannot perform any change on the SQL Server Audit when it is enabled. To change any setting, you should disable it first, perform the change then enable it again. In addition, to be able to CREATE, ALTER or DROP the SQL Server Audit, the user should be granted ALTER ANY SERVER AUDIT permission or be member of the SYSADMIN fixed server role. On the other hand, to be able to write data to the specified file location, the SQL Server service account should have Write permission on that path. In order to write the audit logs to the Windows Security log, the SQL Server service account to be added to the Generate security audits policy. The Server Audit Specifications is a SQL Server feature that is used to track and collect different types of changes that are performed at the SQL Server instance level and raised by the Extended Events feature. These server-level actions are grouped together in the shape of predefined groups of actions that are called Audit Action Groups. These action groups include creating or modifying a server login, successful or failed login attempt, DBCC actions and so on. Starting from SQL Server 2012 and onwards, you can create a Server Audit Specifications using all SQL Server editions. To be able to create a Server Audit Specifications, a SQL Server Audit should be created on the SQL Server instance, with the ability to create only one Server Audit Specification per each SQL Server Audit, as both will be created at the SQL Server instance level. Users with ALTER ANY SERVER AUDIT permission, or members of SYSADMIN fixed server role, can CREATE, ALTER or DROP server audit specifications and bind them to any audit. The Database Audit Specification is an auditing feature that can be used to collect different types of actions, performed at the database level and raised by the Extended Events feature. The tracked database level events can be included as single audit events or in the shape of predefined audit action groups. To be able to CREATE, ALTER or DROP the Database Audit Specification, the user should be a member of the SYSADMIN fixed server role or have ALTER ANY DATABASE AUDIT SPECIFICATION on the database that will be audited. In addition, in order to create a Database Audit Specification, a SQL Server Audit should be created on the SQL Server instance, where you can create only one Database Audit Specification per each SQL Server database per each SQL Server Audit. When a single action is selected, you will be requested to provide the class, the schema and the name of the object that will be audited by the selected action, in addition to the database users or roles that will be tracked using that action. For now, we are familiar with the SQL Server Audit feature components. In the next article, we will discuss how to use the SQL Server Audit feature to audit the different actions performed at the SQL Server instance and database levels. Stay tuned!